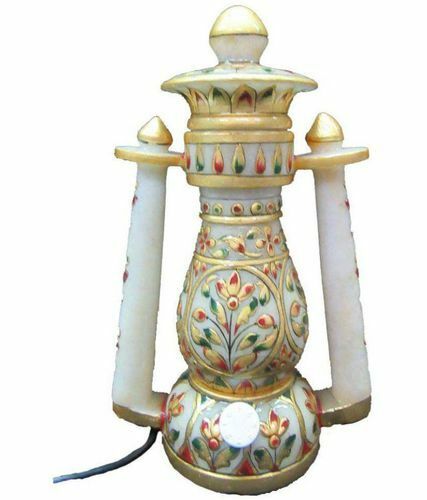 Marble Lamp offered are perfect for use at homes, restaurants, hotels and other similar places which these add a distinguished touch to the surroundings. Featuring fine meenakari work done on the stone’s surface, these lamps come with wide choice of designs so as to perfectly support emerging demands of the customers. Other than this, the exclusive and flawless finish based lamps are developed by experienced craftsmen that allow us to ensure superior finish standards provided to each of the crafted pieces. Established in the year 2012, at Noida (India), we, Kalpana Handicrafts a unit of Century Metals Delhi, have emerged as the leading manufacture and Exporter of handcrafted Marble Decorative, Marble Sculpture and many more. We are engaged in manufacturing, trading and supplying a qualitative range of Stone Crafted Products. Our these products are known for its quality and finish. We run our processing unit in Rajasthan. Auxiliary units are based in Delhi , Agra , Moradabad, Sambhal , Saharanpur, Gujarat, Sirohi. We conform to all the international requirements and are entirely an export-oriented unit. Attractive look, vibrant color and perfect finish are some salient features of our products. Due to their longer service life, attractiveness, stunning shine and accurate cuts, these are highly praised among our clients across the nation. We also lay emphasis on packaging in order to ensure that product reaches in its original form.